LONG ROUTE – registration opens at 07.00am and you may depart from 7.30am – 8.00am. MEDIUM & SHORT ROUTES – registration opens at 7.30am and you may depart from 8.00am – 9.00am. 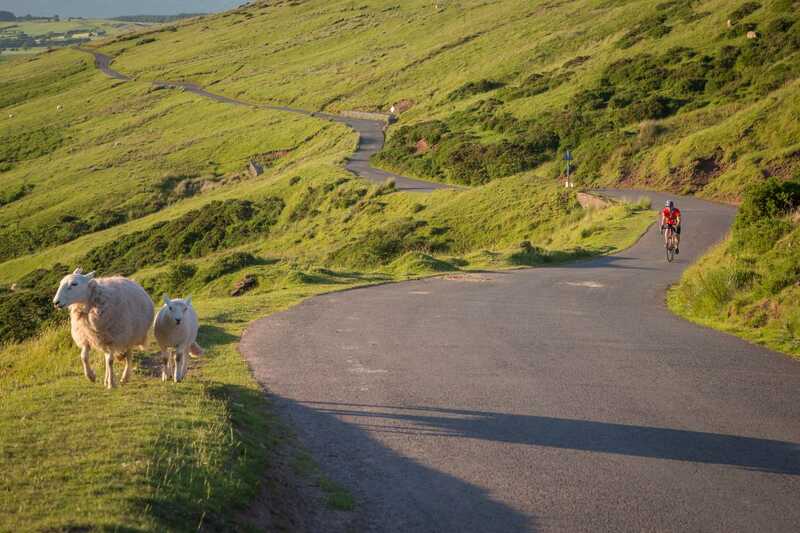 This stunning sportif offers three stunning cycling routes taking in the best of the Brecon Beacons National Park and the Radnorshire Hills. Leaving Hay on Wye on a twisting mountain road, the route climbs steadily into the Black Mountains. Panoramic views of the Wye Valley unfold to your right and nothing more than sheep and skylarks will disturb the peace and quiet as you continue climbing to reach Gospel Pass, Wales’ highest road. Having topped out at 549 metres, enjoy the long descent through a wooded valley past Llanthony Priory. This is simply some of the best scenery you can enjoy from the saddle anywhere in Wales, in fact in the UK! Back in the valley the route heads West to Crickhowell and across the River Usk. Long route riders now tackle the second climbing challenge of the day, The Tumble, as featured in the 100 Greatest cycling climbs list not to mention the Tour of Britain. A swooping descent via Brynmawr and Beaufort brings you back to river level in Llangynidr. Re-join the short / medium route for an easy pedal parallel to the Brecon and Monmouth Canal to the pretty village of Talybont on Usk, site of our first Brecon Beacons Devil Sportive feed station. The route splits on the outskirts of Brecon avoiding the town centre altogether in order to keep the already rural route even more car-free! Long route riders have a hilly section in store across to the beautiful Usk Reservoir and the second feed station at Llangadog on the far western edge of the National Park. Expect empty roads, lovely views and red kites circling overhead. Roll along the valley to Llandovery before a steady, gradual climb takes you back onto country lanes and a section of Sustrans National Cycle Route. At Builth Wells you cross the River Wye and enjoy a blast along the B-road which follows the river southwards to the tiny village of Aberedw. Here feed station number three awaits. Join medium distance riders who have cut a path north from Brecon over lovely sheep-scattered moorland and the atmospheric Brechfa Pool. Now there’s one final test of the legs as you toil up the Edw valley and rumble over the cattle grids by Rhulen, with it’s tiny white-washed church. This is a climb that seems to go on and on but the reward is a big one. You’ll feel on top of the world as you top out on Llanbedr Hill with the entire mountain range you’ve just conquered spread out before you. An unfenced moorland road winds through heather, bracken and pasture. Plunge down through Painscastle and Clyro to the welcoming sight of a “Welcome to Hay on Wye” road sign. The long route is an epic day out in the saddle but don’t think the medium route is a walk in the park! With over 2000m of climbing and 100km+ of pedalling, it’s still an excellent challenge. Our short route is a great choice if you are short of time, new to sportives or looking to push the pace over a shorter distance. Don’t forget this route still includes the classic climb over Gospel Pass! Short route riders stock to the Medium route after the first feed station but then branch off in Talgarth and follow a quiet, undulating back road on the return leg to Hay. We will have one food stop for the short route, two for the medium route, and three for the long route. All feed stations will be in village halls with toilets, mechanical assistance and route maps on hand. There will also be water stops along the route at intermediate points (i.e. in between the feed stations).